Last year I noticed a significant change in my way of viewing things. I'm not sure if having a baby had effected me in one way but, I noticed. I noticed how so little time I've taken to sit and think about life, what's been happening, to pray and appreciate the morning I wake up to see everyone's there to greet you. The new work environment, having a baby and STILL in a long distance relationship is hard to swallow even though I had 365 days to commit and adjust to everything. In the end, I survived. I survived being a zombie for more than half a year (although I still does sometimes), my blank page from work are at least scribbled with something and although I still need to continue dealing with a long distance relationship, I failed to realize that, I have my family to share my thoughts, dreams and pour my feelings too when I needed support. I took them for granted and focus on the things I shouldn't be pushing myself too hard on. So this year, I'm going to start fresh. It's not going to be easy, it will be h*** of a ride again this year but I want to teach myself. I want to constantly remind myself to be grateful for the things I have and not mingle around at things I want when everything I need is all there. We all need a little something extra in our lives but I feel if we are not grateful, it won't be any different. Good things come to those who give thanks, as my husband would say. God bless his soul. So, here it is. 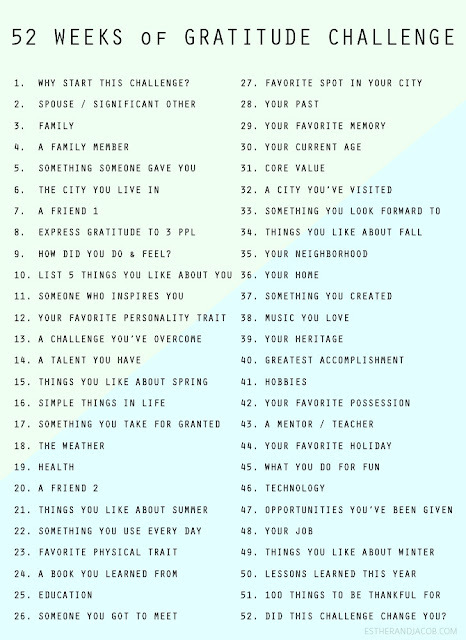 I'm taking on the 52 Weeks of Gratitude Challenge this year created by the wonderful Esther and Jacob of the Local Adventurer blog. Each week there’s a new prompt to get you to start writing a fresh new post. + THE NEW YEAR. This year, I want a better me. Emotionally stronger as I have previously wrote on the short list of my so-called 2016 resolution. 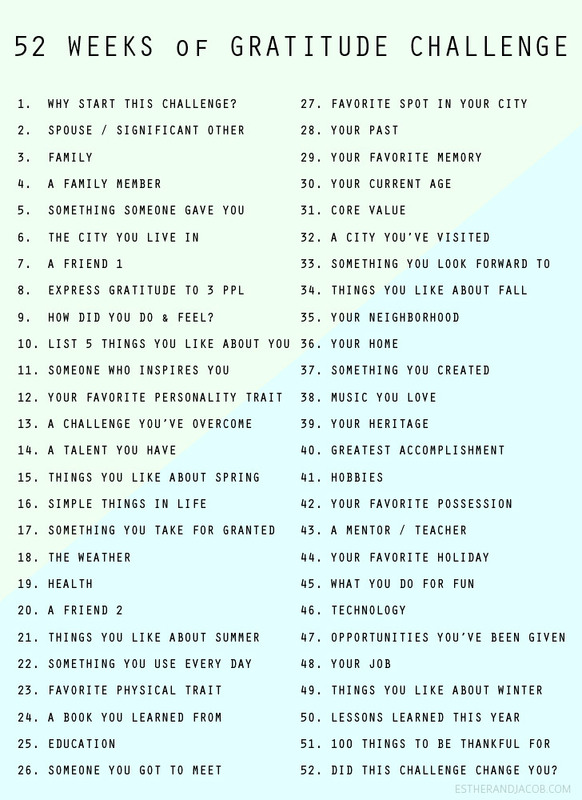 And what better way to guide me than, a prompt challenge. My blog almost died. I almost gave up on it. My hope from this challenge are not only to improve myself but also, pushing me to blog even more and regain what I've lost such as, my writing skills. It's getting rusty. + RECORDING ALL THE GOOD THINGS ABOUT, LIVING. For the past few years, I have either been living at different places, away from my family and from my husband. Looking back at my facebook timeline, I have gone to a whole lot of new experiences. Although at times it does taste really bitter, I understand now how it had helped me grow wiser as a person. I want to have that same feelings I have compiling photos of places I go and people I have encounter along the way, I want to remember all the funny conversations and silly signboard during road trips even though we've go through the same road over hundreds time. I want to be able to read again what I would not be able to remember when I grow old and saggy. I want to keep my memories in still time here in my blog forever. But I wan't everything to be all pretty and with all the blessings, I want to be able to read everything again and feel happy that I was grateful, that I remember to give thanks and be grateful. Come back next Wednesday for the next gratitude post.